Fortunately, for my friend, Milt, this story has a happy ending. It is with his permission that I write this article. I feel it a blessing to have been a witness to God’s gracious hand in the life of my friend, Milton Bridges. The story from my perspective starts in early 2013 when the Mormon sister missionaries met Milt’s wife and started teaching her. I participated frequently in teaching her. She always had a very kind and sincere heart, but it wasn’t until she began seriously studying the Book of Mormon that her heart fully turned to the Savior and she converted to the gospel in May. She had a desire to give away the ways of the world completely and follow Jesus and she was baptized into the Church of Jesus Christ. She was very happy with her new faith and what it could mean to her family. The only problem was that her husband, Milt, wasn’t ready to give up his addiction to alcohol. It was in later that summer that Milt came home intoxicated for the last time. Milt had become a friend of mine through the process of getting to know April and also as he would come and play basketball with us at the church. All of us who played ball grew to love Milt and looked forward to him coming. Sometimes, he would be a little inebriated and we could definitely smell the alcohol, but he was always welcome to come and play and we loved him. When I received the phone call after Milt had broken down and been kicked out of his home for what he feared was the last time to see them, my heart was sad for him, but I was very happy that he had hit the bottom. This meant he was truly ready to change. He was humble and yearned for a miracle. It is at this point, in my experience, that God can work miracles in our lives. 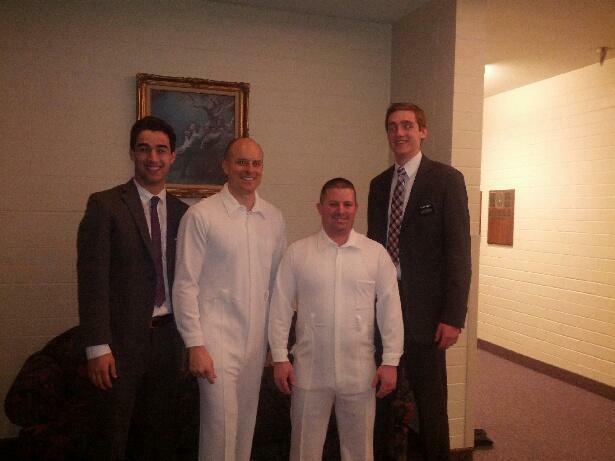 Milt asked me to come over and give him a priesthood blessing. For those of you who are not familiar with priesthood blessings, I’ll describe it as best I can. In the Mormon church, men are given the priesthood authority to act as a mouthpiece of God when called upon when giving a blessing. It is like in the Bible in James 5:14 when he asks if there is anyone who is sick and that if so, they should call upon the elders of the church, who will come and anoint them with oil and pray over them. There are other examples in the Bible of elders coming and “laying their hands” on people to heal them. When I arrived to Milt’s location, he was a very broken man, but he had slim glimmer of hope. This is all that God needed. As I laid my hands on his head, the Holy Spirit moved me on what to say. I can’t remember the exact words, but the feeling I had was that if Milt spent time coming closer to God and studying his word and praying, he would be healed from his addiction. After I gave him the blessing, he thanked me and went to a alcohol rehab center for a month. We (those of us who were his friends in the Church) all prayed for him every day and occasionally heard from him through limited text messages. He came out of the center and was clean and didn’t want to touch alcohol and hasn’t since. It was a miracle! A few months later he began meeting with the missionaries and decided to be baptized. When I was getting ready to baptize him, he told me that when he was given the blessing a few months earlier, that he felt something come over him and the desire to drink was removed. The first step in Milt’s conversion story was the healing of his alcohol addiction. The next miracle was the healing of his heart and the conversion of his soul to the gospel of Jesus Christ. He had been reading and praying for a few months when he realized that he had a testimony of the Restored Gospel of Jesus Christ and wanted to be baptized. He recognized all the blessings his family had received since his wife had joined the Church and he had seen miracles in his own personal life as well. I considered it an honor when he asked if I could baptize him. I had seen everything he had to go through to get to that point and the new man that he was as he embraced the gospel was indeed a miracle. 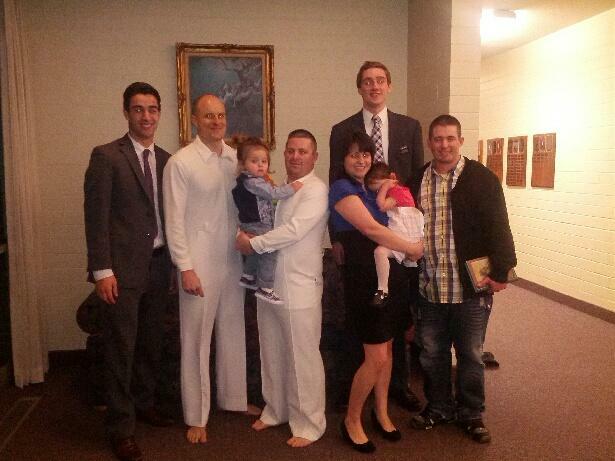 The picture I’ve included is of me, Milt, and the Elders who taught him the lessons prior to his baptism. This is right before I baptized him. When I see Milt with his two cute little kids and his wife at church, and when I see him passing the sacrament, I am amazed at the miracles that each and every one of us can receive if we open our hearts in humility to the Lord. Once we are converted, we then help strengthen our brothers. Milt did exactly this and his brother, was also baptized a few weeks later. Below is a picture of Milt, his wife, kids and his brother. When I see this, the song that comes to mind is one I’ve heard at other Christian churches “Our God is an Awesome God“!